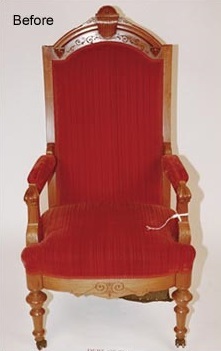 Many pieces of antique seating furniture, particularly those in public spaces, have often suffered numerous reupholstering campaigns that resulted in the wood frames becoming severely weakened or fractured due to the numerous securing of tacks, nails, and staples used to secure the under upholstery and show cover materials whenever possible. 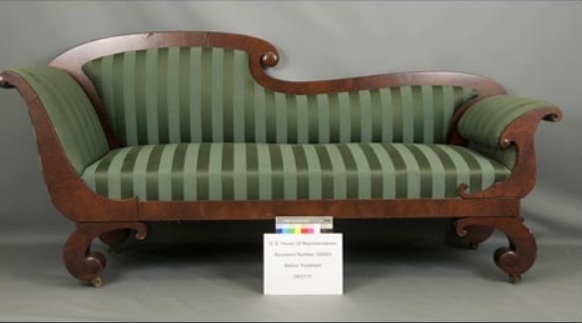 Schuettinger Conservation Services uses nonintrusive or minimally intrusive treatments that do not contribute further weakening to the objects wooden frame while allowing for not only a comfortable and long lasting seating surface but also an accurate historical appearance. 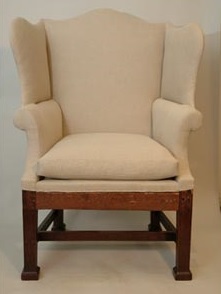 All evidence of original materials is retained. One facet of our approach is the fabrications of new frames which are secured in a reversible manner to the original frame members. These inserts provide the means to securely attach various upholstery components without further weakening of the period frame. 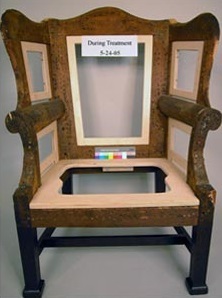 Below from left to right: Before treatment of a rear blind fretwork American colonial period easy/pot chair frame from Pennsylvania or Maryland circa 1770; During treatment with the fabricated micro laminate plywood inserts; During treatment with the linen webbing and undercover with horse hair stuffing; and after treatment with the hand stitched slipcover in a traditional silk damask show cover. 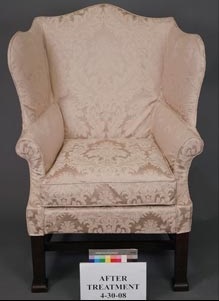 This chair show below is from a collection of the United States Department of the Treasury, which included a traditional upholstery system conducted by a historical upholstery specialist under the direction of the curator and Schuettinger Conservation Services. 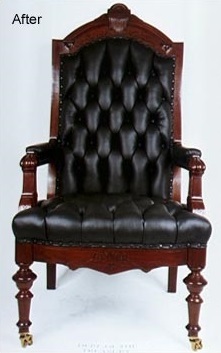 The current button, pleated pattern and leather show cover are an exact replication of the original. 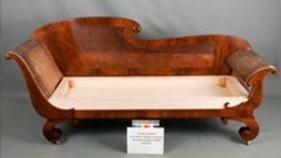 In 2012, Schuettinger Conservation Services was hired by the U.S. House of Representatives to perform a conservation treatment on an American Classical Period American figured walnut recamier Ca.1820, shown below, from their collection which descended in the family of Benjamin Henry Latrobe, the Architect of the Capitol from 1803 to 1811 and 1815 to 1817. 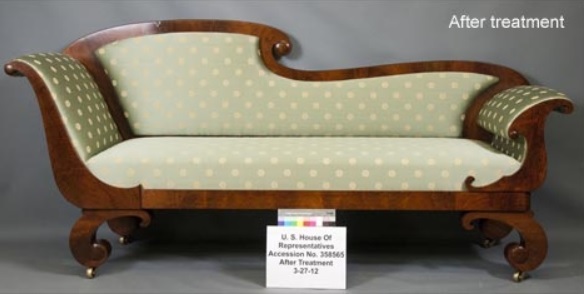 In addition to structural and coating treatments, the frame was reupholstered using a nonintrusive upholstery system with the assistance of a historical upholsterer. During treatment with separate wood substrate for tacking ends installed.